Kitting out your workspace needn’t eat into the budget for the annual office party! Splash out on a few extra cases of bubbly at Christmas when you pick up your everyday printer, storage and desk drawer fillers online using a Choice Stationery Supplies voucher! From paper and pens to expert tools and computer cables, they stock the UK’s most trusted brands all under one user-friendly roof. Originally founded by Paul Andrews in 1998, Choice Stationery Supplies is a family run business which set out to offer quality products at competitive prices. Having started out in Minehead, West Somerset, they now run out of a large warehouse nearby—employing a number of staff who are experts in their particular trade, which covers everything from printer configuration to consumables. Not only do they provide excellent service, but they also stock an expansive range of supplies from a number of well-known brands, as well as their own line of printer cartridges from the "Think" range. They understand that speed and efficiency are at the heart of every great business—including yours—and so they offer quick, stress free service and delivery along with attractive loyalty rewards. With a number of different ways to reach them with your order, by far the most popular option has to be the online route with the added bonus of being able to redeem your Choice Stationery Supplies coupon which can be picked up from our website on your way. Make an attractive saving on your order by applying your Choice Stationery Supplies voucher to the final price when you checkout! With your shopping list at the ready, drop in by our website and pick up your free Choice Stationery Supplies voucher code, and then pop over to the Choice Stationery Supplies homepage to get started. As they’re adding new spotlight deals to their homepage on a regular basis, be sure to give it a quick scan, or simply use the search function to locate exactly the items that you’re looking for. Put the items you’d like to buy into your shopping basket by clicking on their photo, you can also edit your basket at any point by clicking the icon in the top right hand corner of the screen. If you’re in a hurry, simply checkout straight away by clicking “View Shopping Cart” and give your order a final once over. Locate the “Discount Code” box to the left hand side of your page—just beneath the items you are about to order—and enter your Choice Stationery Supplies discount code then click “Apply Voucher”. The discount will be automatically applied and your total price updated. After entering your personal information and payment details your order will be confirmed and soon on its way out to you from Choice Stationery Supplies. Keeping your office well-stocked has never been more affordable! Spend less time sourcing your office supplies and more time concentrating on the important client deadlines you need to meet when you make a saving with Choice Stationery Supplies promo codes! From the smallest of staples to desk furniture and machines, they’ve got all your office needs covered at great prices your budget-setting colleagues will appreciate. All you need to do is give our website a quick click on your way to the Choice Stationery Supplies online shop, and keep a Choice Stationery Supplies voucher to hand at the checkout! Show your employees just how much you value all their hard work by finally upgrading to the latest printer model and watch the productivity scores fly sky high! No need to break the bank when you shop online for your everyday office needs using a free Choice Stationery Supplies coupon, with great deals available across their whole range of stationery supplies. Just remember to visit our website first before you wheel your desk chair over to their website today! Take a quick look at the weekly deals on the Choice Stationery Supplies homepage to see if you can benefit from any of them, or use the menu tabs along the top of the screen to locate the relevant department. Click on a product’s photo to be taken to a page where you can review information about its composition, usage and assembly instructions as well as many more details and specifications. If this is the right product for your needs, simply put it in your shopping basket and continue to browse. When you’re ready, select “Checkout” in the top right hand corner to complete your payment and place your order. Take a moment to review your order carefully, as well as checking the quantities selected, and if you are happy to proceed have a quick look for the “Discount Code” box to the left hand side of your page—just beneath the items you are about to order—and enter your Choice Stationery Supplies discount code then click “Apply Voucher”. The discount will be automatically applied and your total price updated. Stocking up on all the essential supplies for your office at home, at work or at school, couldn’t be simpler as all of the necessities are available from Choice Stationery Supplies online, they provide efficient delivery options and plenty of unbeatable prices every week! Just remember to collect your free Choice Stationery Supplies voucher from us before you start to shop. Free Delivery (as standard) - order before 4pm for next day delivery! Choice Stationery Supplies try their utmost to ensure that your order arrives promptly and accurately, however if you would like to return an item you’ve purchased from them they will be happy to assess your options with you as long as you contact them within 7 days of your item arriving. Please note that certain bespoke items, such as personalised furniture, may not be returned. If the item is faulty you will be eligible for a full refund or replacement. All other return enquiries will be assessed individually as per their returns policy. Check in with them regularly and find out as soon as the new Choice Stationery Supplies voucher becomes available so you can stock up! Buy now online at www.choicestationery.com. Stationery isn't something you think of as a big expense, but if you're running an office the costs soon mount up. 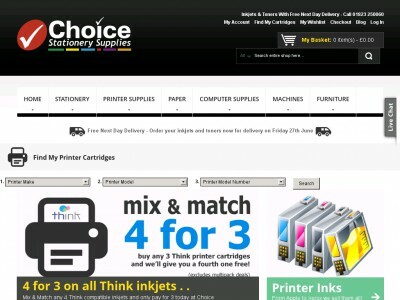 My sister made great savings at her workplace by using a Choice Stationery Supplies voucher at choicestationery.com. They stock a great range of printer and computer supplies – all of which can be discounted with a Choice Stationery Supplies coupon. Just visit their website, enter your Choice Stationery Supplies voucher code and enjoy your savings. Want to earn some brownie points? Recommend Choice Stationery Supplies vouchers to your boss too!